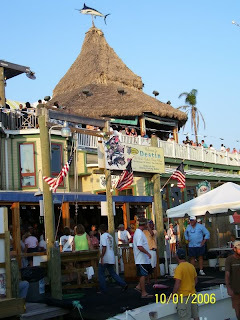 Located on Destin's harbor, AJ's Seafood & Oyster Bar is our favorite "wet spot" in Destin. AJ's has one of the best views around, with boats of all kind coming and going through the harbor. You're sure to see your "dream boat" while sitting at the open-decked bar and enjoying a cocktail. The deck starts kicking at 4pm with live music seven days a week until 4am. AJ's also offers a two hour cruise on the "Sea Blaster", which is a bargain with free beer and wine. We do this every time we visit Destin, and often see dolphin. The "Sea Blaster" truly is our favorite "tourist" thing to do.